Digitaria ischaemum (Schreb. ) Schreb. ex Muhl. Culms: Ascending or erect from spreading bases, usually bent, slender. Blades: Flat, .6 to 6+ inches long, 1/10 to 2/5 inch wide, midrib absent, often purplish, glabrous to very sparsely hairy near ligule. Sheaths: Keeled, glabrous or with sparse hairs on upper margins. Inflorescences: Racemes, 2-8, spike-like, 1.6 to 6 inches long, extending in different directions from a common point, terminating main inflorescence axis; rachis flattened, less than 1/20 inch wide, thin-winged. Spikelets: Lanceolate-elliptic, 1/16 to 1/12 inch long, grouped in 2 rows on 1 side of raceme branch axis, 1-flowered, sessile or short-stalked, becoming dark brown or purplish-black; first glume absent or underdeveloped; second glume elliptic, 1/16 to 1/12 inch long, sparsely to densely pubescent with minute gland-tipped hairs; tip sharply pointed; sterile lemma about equal to second glume, 5-nerved, pointed; fertile lemma ovate-elliptic, pubescent; tip sharply pointed; margin thin, transparent. Habitat: Moist, disturbed sites, stream banks, lake and pond margins, roadsides, open woods, fields, gardens, waste areas. 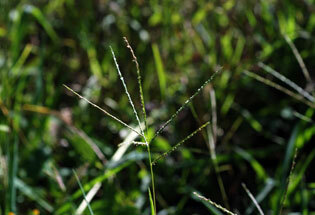 Comments: Smooth crabgrass forms loose tufts and is often a troublesome weed. It resembles hairy crabgrass Digitaria sanguinalis, but is less common.